(Bloomberg) -- Brookfield Asset Management Inc. is considering making an offer for Dutch phone company Royal KPN NV, according to people familiar with the matter. KPN shares jumped the most since 2013. Canada’s largest alternative asset manager is holding exploratory talks with Dutch pension funds PGGM and APG Groep NV about partnering on a potential bid for KPN, said the people, who asked not to be identified because the matter isn’t public. The company had a market value of about 10.6 billion euros ($12.2 billion) on Wednesday, before Brookfield’s deliberations were reported. Brookfield hasn’t approached KPN yet and discussions are at an early stage, the people said. The firm may opt to not proceed with an offer, they said. Representatives for Brookfield, KPN and PGGM declined to comment. APG didn’t immediately respond to a request. “If such a transaction would go through, it would lift the whole telco sector, potentially massively, because it could imply that you will see more M&A,” Emmanuel Carlier, an analyst at Kempen & Co., said in an interview. Success with this deal could imply future interest from bidders beyond pension funds and may drive cross-border consolidation in the industry, he said. 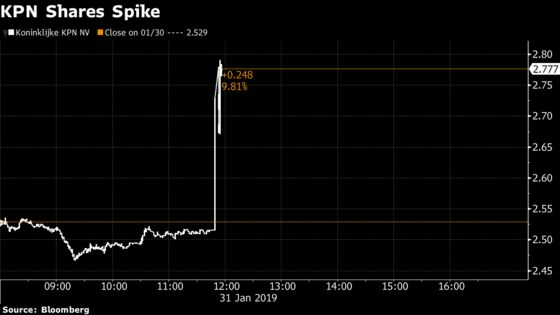 KPN shares gained 6.2 percent in Amsterdam trading after rising as much as 11 percent earlier in the session, their largest intraday gain since August 2013. The Stoxx 600 Telecommunications Index rose as much as 1.5 percent. KPN rebuffed a takeover bid in 2013 from America Movil SAB, the Latin American mobile-phone operator controlled by billionaire Carlos Slim. America Movil is KPN’s largest shareholder, with a 16 percent stake as of September, according to data compiled by Bloomberg. An independent foundation, set up to protect the interests of KPN’s stakeholders, impeded America Movil’s offer by using a protective measure to temporarily gain about half of KPN’s stock. “We were surprised by reports of the offer,” said Arturo Elias Ayub, a spokesman for Slim. “It’s a good company and it’s very attractive at these levels.” He wouldn’t comment on whether America Movil would consider selling its stake or at what price. KPN, a former monopoly, is contending with a tough competitive landscape in the Netherlands, where rivals have been merging. Fierce competition from regional giants such as Vodafone Group Plc has also contributed to falling sales in recent years. Chief Executive Officer Maximo Ibarra said last year that he plans to cut jobs and simplify the company’s IT systems to help profits and cash flow. Brookfield, with more than $330 billion in assets under management, has a long history of investing in telecom. The Toronto-based firm recently closed its $1.1 billion purchase of an AT&T Inc. data center business. Nordic carrier TDC A/S agreed to sell itself to a group led by Danish pension funds and Macquarie Infrastructure and Real Assets last year for about 40.8 billion kroner ($6.28 billion).